There’s been a murder, and it’s up to you to solve it, Guardian. 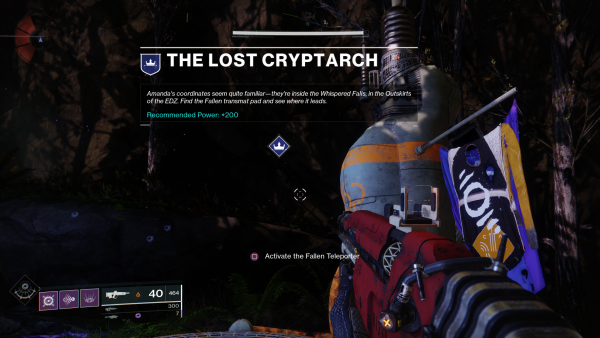 Amanda Holliday is offering up a quest called The Lost Cryptarch, which involves the untimely death of a Cryptarch called Master Ives. Your reward for your troubles? 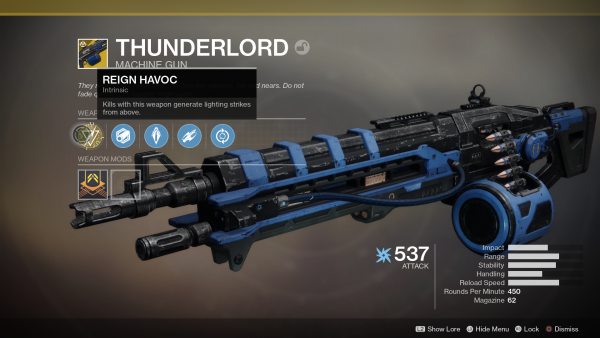 The Thunderlord Exotic machine gun. If you head over to the Hanger in the Tower, she’ll be waiting there to get you started. 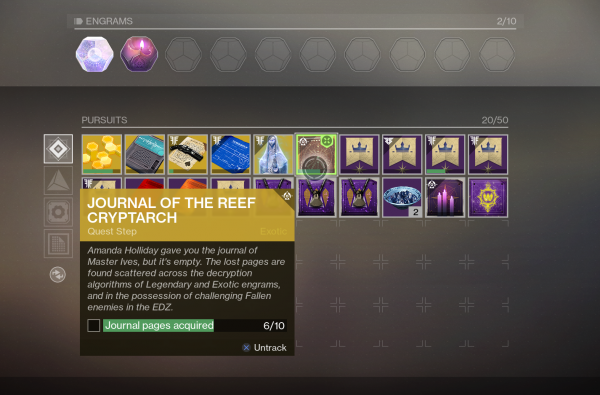 You’ll receive a Pursuit called Journal of the Reef Cryptarch. This mission is split up into several stages and will be available until April 23. Some are hidden in Legendary and Exotic Engrams. 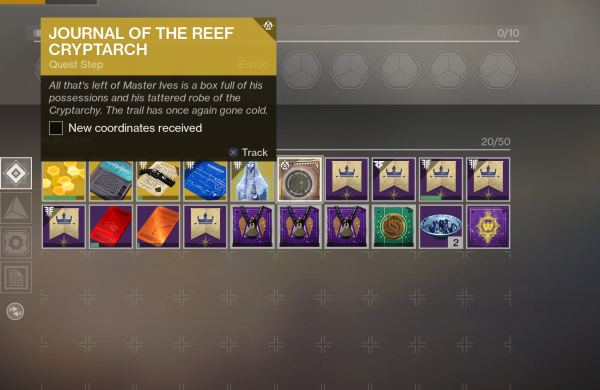 There’s every chance you might find all 10 pages in one drop, but the easiest way we found to source them was to head to the EDZ and complete two Public Events – turn them into Heroic Events if you can – and the pages dropped after killing the yellow bar Fallen enemies. Upon finding all 10 pages, the Pursuit will update to say that the unique encryption on each page is uncrackable by conventional means, so Holliday is using her contacts to find a way to crack them and will be in touch in due course. We’re staying in the EDZ for this next part of the questline, exploring four Lost Sectors. 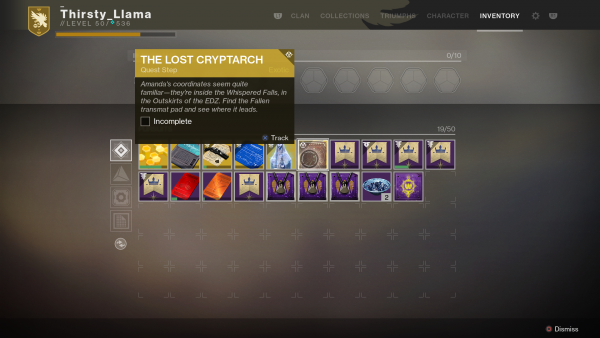 The Pursuit, Journal of the Reef Cryptarch, now says that Holliday and her sources have decrypted the pages you found and that there’s a link to the Fallen. 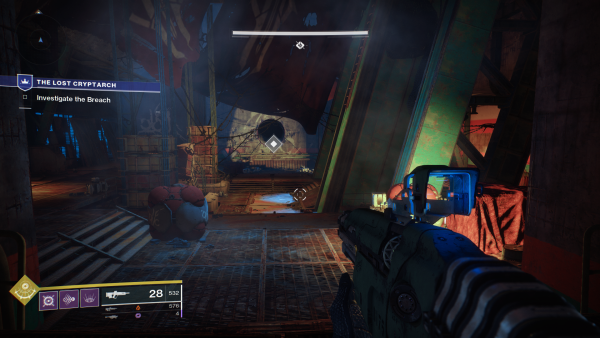 You’ll need to search the Atrium, Terminus East and Widow’s Walk to find and defeat yellow bar Fallen enemies and loot the chests in each area to proceed. We’ve highlighted the three initial Lost Sectors in yellow on the map. 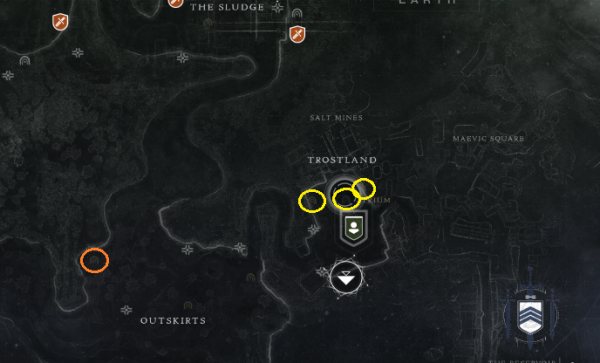 Once you’ve searched and looted each of these Lost Sectors, the quest will update again. The Pursuit tells you that no clues were found during your search, but that there’s a lot of Fallen chatter about another Lost Sector, Whispered Falls. Whispered Falls is over in the Outskirts of the EDZ. The orange circle on our map highlights where it can be found. 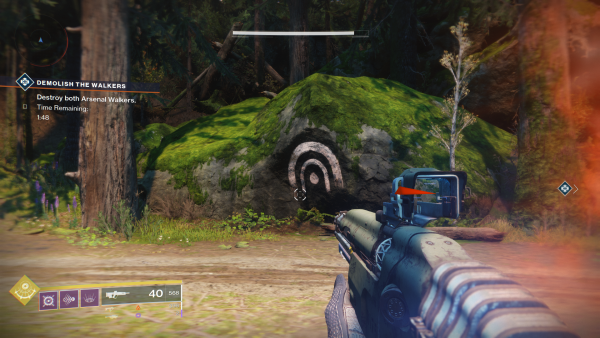 You’re looking for the Lost Sector symbol on a grassy rock. Jump over the rock and head towards the rock face to find the cave entrance. The path in this cave is quite a tight squeeze and a bit confusing, so you might end up back outside once or twice until you get your bearings. It’s the same script once you’re inside: defeat the yellow bar enemy and loot the chest. The quest will update a final time to say that all you’ve found is a box of his possessions and a tattered robe and that your trail has gone cold. The final stage of this quest is now available, so you’ll need to head back to Amanda Holliday for some more details. After speaking with her, the Pursuit will update to say you’ll need to return to the Whispered Falls Lost Sector in the EDZ and look for a transmat pad. As before, clear out the enemies and head to the chamber and defeat the yellow bar Fallen enemy. The transmat pad is in this chamber and you won’t be able to miss it. Step onto the pad and interact with it to begin. You’ll then be teleported to the Cosmodrome in Old Russia, which Zavala won’t be too pleased about. If you carry on forward from the pad, you’ll soon find a door leading to the Breach. This open area can become overrun with enemies quite quickly, so if you want to run inside and ignore them all, we wouldn’t blame you. Follow the tunnels until you reach a room where a yellow bar Fallen enemy, Kikliss, Murderer, will spawn with a bunch of adds. The easiest way to defeat him is by clearing out all the adds first, then moving around the room and timing your shots. He’s a slow mover, so aiming with a grenade or rocket launcher should be easy. Once you depleted roughly half of his health, another yellow bar enemy will spawn and a few more adds. Just keep hammering away at them until you defeat them both. Once you’ve done that, head back outside to the transmat pad. There are various things you can scan in the Cosmodrome, so you can take your time and poke around if you wish. 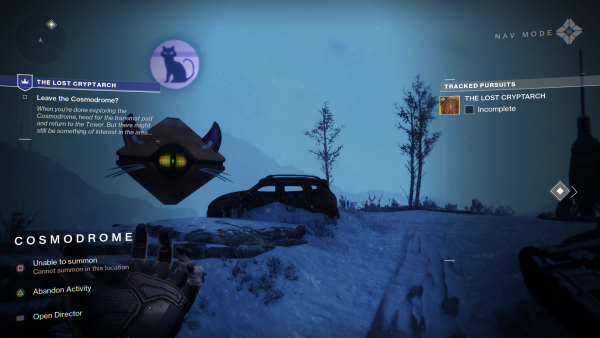 There’s a car you can scan which will either throw you a curve ball about your first meeting with your ghost, or a story about Cayde-6 and Holliday. 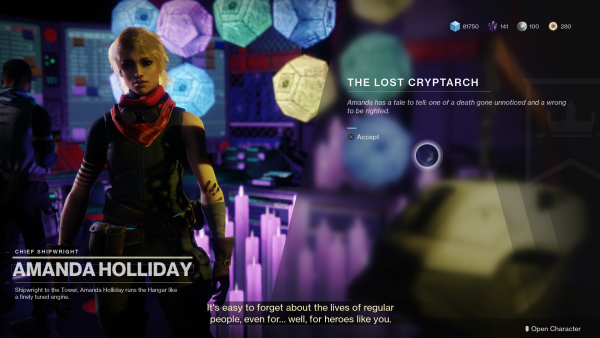 Return to Amanda Holliday and she will give you Ives’s Last Engram. Take it to the Cryptarch and you’ll receive the Thunderlord Exotic machine gun. You can see what changes are coming in Arc Week here. Check out our ultimate Destiny 2: Forsaken guide for tips, tricks and walkthroughs for succeeding in Gambit Prime, how to get Thorn and where to find Xur and his Invitations of the Nine.